It’s been refreshing to notice the different approaches with each new Netflix Marvel series. Daredevil is a dark action show with brazen stunts and high-flying battles. Jessica Jones looks inward and reveals the emotional demons of a powerful hero. There’s a formula to organizing the seasons, yet each one still feels unique. This trend continues with Luke Cage, which has more room to breathe. It’s fun to hang out in this world and meet the players that populate Cage’s Harlem. The barbershop scenes in the early episodes just show people talking, yet they’re far more engaging than the fights. There are still obstacles for Cage to overcome, but the story doesn’t focus solely on the next encounter. I’m splitting my review into three parts with each article covering four or five episodes. I’ve read complaints that Luke Cage is too long and drags in its second half. However, I’ve noticed few slow points in the opening four episodes. The relaxed pace gives us a chance to spend time with both the heroes and villains and avoid rushing to the climax. Mike Colter (The Good Wife, The Following) made a strong impression as Cage in seven episodes of Jessica Jones, so there’s little need for much of an intro here. The heavy lifting for Creator Cheo Hadari Coker (who also writes the first two episodes) is introducing the rest of this universe. The Harlem setting feels lived in, and we join the action in the middle of an ongoing story. Beyond Colter, the standout performers are Alfre Woodward as Mariah Dillard and Mahershala Ali as Cornell “Cottonmouth” Stokes. Both have over-the-top moments (especially Ali), but neither goes into D’Onofrio territory. It’s entertaining to watch the characters spar with each other and their enemies. He’s open about being a criminal, while she hides behind a legit enterprise. Mariah is no more ethical than her cousin; she just prefers to keep her distance. Typically more serene on screen in shows like The 4400, Ali shines when Cottonmouth loses control. There’s a glee for the guy who’s usually above the fights to take matters into his own hands. When Cottonmouth pulls out the rocket launcher and goes after Cage, the excitement is all over Ali’s face. 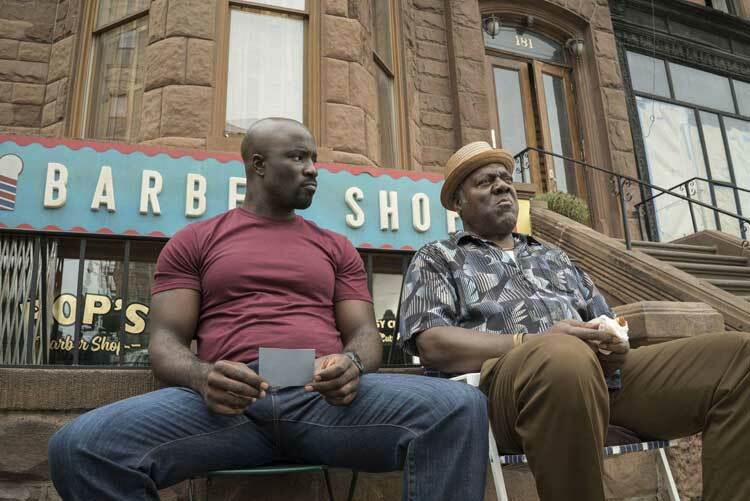 Luke Cage begins with a lengthy barbershop scene that may throw off some viewers. It’s needed to set up the pace and environment of this show, however. This sequence also immediately shows Cage’s close relationship with Henry “Pop” Hunter (Frankie Faison, The Wire). After even a few moments, I was already nervous that Pop would die. It’s an easy narrative move to remove the kind father figure and push the reluctant hero to jump back into the field. We don’t tune in to see Cage just wash dishes and sweep floors. The frustrating part is how predictable Pop’s death is for most of the audience. Colter sells Cage’s anger and sadness at losing Pop, but it’s too easy. With that said, the second episode “Code of the Streets” is also the strongest of the opening four. The premiere creates the mood and allows the action to increase in the second episode and build to the barbershop shooting. Faison takes center stage while trying to help a young guy on the run from Cottonmouth. He brings humanity to the beloved Pop; the barbershop was Switzerland for everyone. Losing that haven will only increase the chaos to come. Cottonmouth is partially responsible for Pop’s death, but it’s also a sad moment from him. Unspoken rules about who’s untouchable don’t always translate to younger henchmen. In the mostly white Marvel film and TV world, it’s refreshing to have a cast dominated by African-Americans. Actors that usually play supporting roles like Ali, Faison, and Ron Cephas Jones deserve more attention. Simone Missick also stands out as Misty Knight, a determined cop and possible match for Cage. Knight sees through the BS and recognizes something different in the big guy. She investigates on the other side with her partner Rafael Scarfe (a strangely over-the-top Frank Whaley) while Cage battles Cottonmouth on the inside. I’m not a comics expert but know that Knight is a familiar name; she’s unlikely to remain an outsider for too long. The unspoken chemistry between Colter and Missick clicks from their very first scene at the club. What’s surprising about Luke Cage is my lack of interest in most of the action scenes. It’s fun to watch Cage mow down hordes of guys in “Who’s Gonna Take the Weight”, but it gets old quickly. There’s little tension when the bullets have no effect. What makes the fights work is the limited time we spend on them. The nightclub performance scenes are more energetic because they aren’t so familiar. I’d rather see Cage stare down Cottonmouth without throwing a punch than battle endless goons. After the many fights in Daredevil’s second season, the restraint in Luke Cage is a relief. When Cage steps up to the plate, it’s really earned. Of course, there are dangerous consequences to joining the fight. I like origin stories, particularly on TV series. When done well, they enhance present-day events without making obvious links. The fourth episode “Step in the Arena” mostly succeeds in enriching Cage’s back story. Directed by Vincenzo Natali (Cube), it presents a time when Cage had normal strength and big hair. Charles Murray’s (Sons of Anarchy) script packs a lot of material into a single episode. We learn how Cage gained his powers and fell in love with Reva (Paris a Fitz-Henley). The prison setting and guards are familiar, yet the story largely clicks. It’s no stretch to see Cage (originally Carl Lucas) as a slave rising up to stop the masters. Although he largely fails, that choice creates Luke Cage the hero. There’s even a fun “Sweet Christmas” moment when Cage discovers his powers. After four episodes, I’d place Luke Cage alongside Jessica Jones as a contender for the top Marvel show. Daredevil is also great but stumbles a bit in its second season. There is a long way to go here, so it’s too soon to make a definitive statement. With a talented cast and plenty of interesting stories, its potential is sky high. There’s a definite ‘70s vibe, but it still adds modern touches to keep us engaged. It’s a slow burn, but I’m on board for the long haul. I can’t wait to see what happens next. Having mainlined Luke Cage you're right where I was after episode 4. I felt, unfortunately, that the show declined fast after episode 5. There's so much that goes unsaid and so much sloppy writing. By the end... well, I'll let you make up your own mind. I haven't read any reviews, but that's the general impression that I've gathered. I'm trying to keep an open mind since I've enjoyed the start so much. Still, it does have me a little concerned. It is a slow burn, but one that has drawn me in. I'm 9 episodes deep and still like it. Looking forward to the rest of your take on it. Great. I just watched episode 5 and am still on board, though I'm curious of what will happen when Diamondback inevitably takes over as the main villain. I really like Ali, but Cottonmouth's time is coming. I'm right in the middle of episode 5 right now. Mahershala Ali is the best thing in the series right now. The man has a laugh that is both filled with joy and filled with menace. I'm a little disappointed so far in that for as well written as the locations are and for as lived-in as this Harlem feels, there weren't a lot of plot twists up to this point that I haven't seen coming. To put that bluntly, none of the deaths so far have shocked me even a little. Ali is so good! I just finished episode 5 last night, and I'm worried he's not going to last too much longer. That might be the plot twist we're going to see. I feel like the set-up has been great, but I can't really say where we're heading (beyond Diamondback showing up at some point). That could be good or an issue, depending on where it goes.